Style: Classical Revival with Rusticated Italianate elaboration and Romanesque elements, employing Ionic Order in blind arcades with steepled tower imbedded in pediment gabled facade. Architect: Chauncy Graham & Son of Elizabeth, N. J. Contractors: Absolom W. Price, masonry; Robert Baughn, carpentry. Steeple: 178' (including 124' spire); built of native blue limestone; originally auditorium and gallery surrounding three sides, capable of seating 1,000 persons. Ceiling of auditorium: 30 feet high. Bell weighing 2,095 pounds cast at Meneely Bell Foundry, Troy, New York. In May 1893, Henry Merriam donated $10,000 for interior renovations, to which congregants added $8,600. Isaac Purcell of Philadelphia engaged as architect. In August 1893, old pews sent to churches in Franklin and Flatbrookville. Interior woodwork of polished oak, including ceiling, galleries, pulpit and pews, installed. Walls of delicate color relieved with light band of gold extending around three sides of room and all windows. Stained-glass windows with amber grounds installed. Pews arranged in semi-circles focused upon pulpit. Six boxes with upholstered chairs situated in each side-gallery. Pipe organ with oak case made by N. C. Harrison & Company; choir gallery placed a few feet lower than side galleries to place choir in proximity to congregation. Two candelabra, with seven lights (fashioned after gold candelabrum of Mosaic Tabernacle) hung in front of organ gallery. Three chandeliers hung in auditorium and gas jets installed beneath galleries. Oak pulpit and communion table installed. New interior dedicated February 1, 1894. 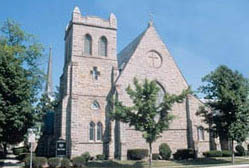 Charles Graham & Son designed a new stone church in Italianate style for Newton Presbyterians in December 1865. The cornerstone of the new Presbyterian Church  third church building erected on or near this site was laid August 19, 1869. 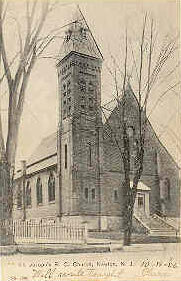 An account from August 1869 described the architectural design of the new Presbyterian Church: "Its outlines will be of the Ionic order, plain but beautiful in its simple style of architecture, 98 by 64 feet, tower 20 feet square, projecting 6 feet, and 54 feet in height, surmounted by a spire 124 feet high, making the total height of the steeple 178 feet. The walls of the building will be of native blue limestone, finished with six pilasters on each side, running from top to bottom of the building, with circular heads, the intervening space between the pilasters and windows to be laid up with rubble work. The front will be finished with pilasters three and a half feet in width. It will contain three doors, with a window over each door. There will be three vestibules, with stairs leading from the outer ones to the galleries. The interior will be finished with an auditorium and gallery surrounding three sides, capable of seating about 1,000 persons. There will be a recess in the pulpit, projecting four feet beyond the main wall, containing a sky-light. The ceiling of the auditorium will be 30 feet high. The basement will be 30 feet wide extending from the rear of the church to the tower, and will only be used for the heating apparatus. The edifice is estimated to cost $36,000 and to be finished by July next. The architects are C. Graham & Son, Elizabeth, NJ. : A.W. Price, Newton, contractor for stone work; Robert Baughn, Newton, contracting carpenter. When completed it will be one of the most imposing buildings in the State. The builders have the lime-rock, lime and sand, and slate to cover it, close at hand, which reduces its total cost much below that of building of similar class and material in other sections of the State." A bell weighing 2,095 pounds, cast at the Meneely Bell foundry of West Troy, New York, was mounted in the belfry. 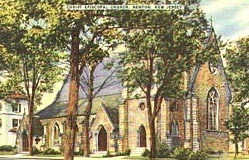 The church was dedicated in May 1871. John Merriam of West Pittstown, Pennsylvania, brother to Henry Merriam, designed a stone Chapel of "gothic style", 46.6 feet by 57 feet in 1886. It was constructed of rustic stonework with corners dressed to a line, on a site adjacent to the Presbyterian Church. In May 1886, the masonry contract was awarded to Absolom Price of Newto and the carpentry contract went to W.C. Tench of Pittstowl Pennsylvania. Ground was broken June 4, 1886. 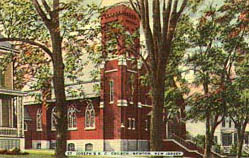 The Chapel was dedicated September 19, 1887, after a total expenditure of $8,227.98. In June 1916, Henry T. Stephens submitted plans for an addition, 47.6 feet by 76 feet, two stories in height, to the rear of the Chapel, constructed of stone to corre spond with the main building. Raymond Jelly, chief architect of the New Jersey Zinc Company, designed another addition in 1925. Work by contractor William L. Houghton began April 17, 1929. Dedication of the new recreation hall, church kitchen and chapel addition was held February 7, 1930. The old Chapel was gutted by fire on February 15, 1931. The new recreation hall at the rear suffered minor damage from smoke and water. Charred walls of the Lecture Hall, erected in 1886, were intact "and a two-story structure was built within them to replace the old one story and balcony structure." Clinton Kellam, contractor, did the work of renovation. The newly rebuilt Chapel was dedicated October 29, 1931. The spire of the church was replicated and replaced in 1989.
crosses in gilt; Ground work of roof in dark sage green with broad bands of maroon and olive, decorated with gilt designs; Chancel and nave arches outlined in gold. 24 -burner corona donated by John W. Lane; light plush dorsal placed behind altar. Carpet of blue ground with maroon vine pattern installed in chancel and aisles. In March 1912, front row of pews removed, platform enlarged and choir stalls for 24 singers installed; lectern used byRector at services. In September 1912, brass and oak pulpit by Gorham & Company of New York donated by children of Samuel Clarkson Dunn and Anna Prescott Le Breton Dunn. 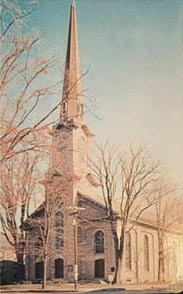 Steeple removed in 1937. Christ Church was erected 1868 in Rustic Gothic Revival style, as designed by Jonathan V. Nichols, architect. Native blue limestone, laid as coursed rubble with raised pointing, is highlighted by Newark sandstone trimmings, weatherings, dripcourses and water table, under a roof of patterned black slate (quarried in Newton). The contract with Isaac Overton of Newark "for the building of a new church...for $23,000" was authorized May 18, 1868. Christ Church employs simple basilican plan of a nave flanked by shed aisles with corner buttresses. The southwest aisle has a three-story square tower and two stone porches. A slated wooden steeple, reaching 108' above ground, surmounted the tower until its removal in 1937.
and windows being cut from Newark red stone. The masonry being of the style of architecture of the fourteenth century and in stone, with which none in the State can compare for finish, the effect will be most pleasing, and well worth the attention of those about to construct similar edifices. The auditorium will seat 400 persons; the roof being traceried, of the flamboyant style, the window in the chancel to be rich tint glass by Fredericks of Brooklyn, and the woodwork to be finished in hard oak. The design and workmanship when completed will be an ornament to our town and a lasting credit to the architect and builder." The adjacent Parsonage was erected 1869 in Gothic Revival style, using limestone in rockface ashlar, laid in broken courses. Rev. William Welles Holley occupied his new rectory in April 1870. In January 1902, the Ladies Church Guild converted the old parsonage to a parish hall, named Holley Hall in honor of its first occupant. Style: Gothic with Italianate Patterned Brickwork tower. Overview: The post card view to teh right shows st. Joseph's church in 1906. It was built of Ridgeways Brick, made in Newton, New Jersey. The native blue limestone is used for the foundation. 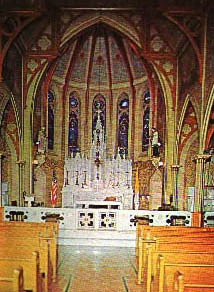 Originally 100 pews capable of seating 450 persons; Pillars, beams and arches of pine with black walnut trimmings; Wainscoting of alternating strips of pine and black walnut; Each stain-glass window (seven on one side, six on the other) originally bordered with red, green, purple, scarlet, lake, blue or yellow (opposite windows having borders of same color). Chancel windows depict: St. Joseph (center); Blessed Virgin and St. John (to left); St. Teresa and St. Edward (to right). Sacristy originally located to left of main altar; small altar to right. Two confessionals were located in basement. A 500-lb. bell cast at McShane Foundry of Baltimore added in 1881 by donation of Anne O'Leary. Interior redecorated and sanctuary frescoes done in 1892 (by Daniel Sutton). Hand-carved Stations of Cross from Germany donated in 1892 by Thomas Farrell (and removed 1966, together with original statues). Electric lights installed in 1899. Twelve clerestory paintings done in 1914: The Annunciation (memorial to Michael Quinn); The Marriage of Mary and Joseph (Mr. and Mrs. Fabian Weiss); The Visitation (Gift of Children of Mary); The Nativity and TheAdoration of the Kings (Gift of Polish Parishioners); Warning to St. Joseph (Robert Hamil); Presentation in the Temple and Flight into Egypt (Memorial to William J. Clary); Going Up to Jerusalem (Rev. James Mulhall, former pastor); The Home at Nazareth (Children of St. Joseph's); Death of St. Joseph (Memorial to deceased pastors). Domenico Borgia of New York designed the marble altar, which were carved in Carrara, Italy; Ellen Kays McLaughlin, Papal Marchioness, donated the main altar, which was dedicated November 28, 1915. Electrician Simonson installed electric lights in the church in June 1916. Reverend Michael J. Donnelly consecrated the side altars on August 11, 1918. Electric pipe-organ installed in 1926. Front entrance rebuilt and sacristy enlarged in 1931. Interior painted and stain-glass windows installed 1938/39. Teresa Concilio donated new pews in 1948. Entrance rebuilt in 1998. Reverend Richard Bolger conducted the first Roman Catholic Mass on record in the village of Newton on November 25, 1821. Prior to construction of the first Catholic Church on Jefferson Street in 1855, masses were said in private homes, including the house of Edward McCormick on Spring Street and the Blackwell residence on Church Street, then occupied by Francis Gray as a dwelling and harness shop. The earliest known priests to extend their ministry into Sussex County included Father John Callan, of Dover; Father Senez, of Madison; and Father B. J. McQuaid, of Madison (and later Bishop of Rochester). Father McMahon was appointed to the Parish of Sussex County in 1854, becoming the first resident priest. The Right Reverend Bishop Bayley, of the Roman Catholic Diocese of Newark, purchased two of the Conover Town Lots, situated a few yard southeast of the Newton Graveyard, in February 1855 for building a Roman Catholic Church. Reverend McMahon, the officiating Catholic priest in Newton, negotiated the sale. Irish Catholics erected a simple frame Church within the present confines of the Old Catholic Burial Ground on Jefferson Street in the autumn of 1855. It remained pewless, rough boarded without and unplastered within for several years. The Reverend Father James McKay, later of Waterside parish in County Derry, Ireland, succeeded Rev. McMahon in November 1857. In August 1861, Father McKay went to Orange and Reverend M. Byrne, assistant at St. Johns Cathedral in Newark, came to Newton. Rev. Father McCosker became pastor on August 14, 1861. A parochial school opened in the church basement in April 1864. The contract for building St. Josephs Church was awarded to mason Michael Quinn and carpenter Thomas Malloy, of Newton, for $9,700 in May 1871. The architect was Lawrence OConnor. Brick from Ridgeways Newton Brick Yard was used with local limestone trim in a Gothic design. The cornerstone was laid June 11, 1871. The building is 71 feet in length by 43 feet in width. Beside the body of the church, there were two additions: a vestry 15 by 10 feet and a sanctuary of circular form, 15 by 20 feet. The sidewalls, of Sussex blue limestone, were 16 feet in height, and the basement wall 10 feet. The tower, ten feet square, was constructed of brick, rises 50 feet from its base and about 70 feet from the water table. St. Josephs Church was dedicated September 1, 1872. Father G. W. Corrigan re-opened a parochial school in September 1881. In August 1882, classes were relocated from the church basement to the old church building on Jefferson Street. The Sisters of Charity were given charge in September 1886. The earliest teachers of record were Sisters Celestia, Cornelia, Dolorita and Mercedes. In October 1954, St. Josephs parish announced plans to build a parochial elementary school on the old railroad spring lot at the intersection of Jefferson and Halsted Streets. Anthony J. De Pace, of New York, designed the new building with eight classrooms. St. Josephs Roman Catholic School opened in September 1956 with an enrollment of 179 students and teachers provided by the Sisters of Christian Charity. A large addition was built in 1968. Overview: Original frame church on site built in 1847 was renovated 1909, but burned on March 6, 1910. Old church moved to rear of lot. Memorial windows, made in 1909, were salvaged from burnt church. New church built of buff brick from Ridgeways Brick Yards, Mountain View, New Jersey. Thomas C. Teasdale sold a .15-acre lot at the intersection of Main and Liberty Streets to William S. Hibler on January 15, 1841, for the purpose of building a Baptist Church. 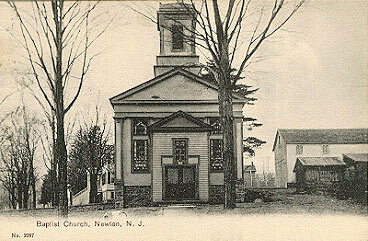 The first attempts were frustrated, but on February 25, 1847, the First Baptist Church of Newton was finally dedicated. In November 1847, the Trustees made their first assignment of family pews. The Building Committee consisted of: William Townsend, William S. Bagshaw, E. A. Muir, Irving Cook, Roscoe B. Kishpaugh, William Edgerton, Harry L. Voorhees, William Toy, R. Wilson, George Condit, A. Parcells, and Howard Cole. George A. William received the contract to build the new Baptist Church for $10,800. The design of architects Everett, Kilburn & Taylor, of New York, called for a white brick veneer manufactured by the Rockaway Brick Company. Marble dealer Jacob Benz presented the cornerstone. The old auditorium was repaired and removed to the rear of the lot for use as Sunday school rooms. A new auditorium was constructed so that it and the Bible school rooms would be on the same floor, connected by a passageway. The interior of the church was trimmed with a rich dark oak, with matching pulpit furniture. The twelve memorial windows from the old church were re-used . The old seats were also utilized and new ones installed to correspond with the general furnishings of the church. The metal ceiling is of Greek design and the walls plastered in white sea sand finish. The vestibule is located in the bell tower, over which is a room, reached by an oak staircase, for use of the pastor, furnished by the ladies of the parish. Gas and electric lights were placed throughout the edifice. The auditorium was designed to seat 350 congregants. The main Sunday school room had a capacity of 150 and the primary room, a capacity of 75. The floor in the auditorium is inclined, made of hard wood. The furnace and kitchen were located in the basement. The exterior is a frame structure, covered with white silica brick. The baptistry is located behind the pulpit and beyond that is a triple leaded glass window, a gift to the congregation from contractor Clinton W. Kellam. The choir is on the right of the pulpit, as in the old church. Most of the cost of $11,500 was raised through small contributions and the plan of selling bricks for one dollar was adopted. The slate roof was donated by the Lafayette Slate Company. Pastor John R. Humphreys dedicated the new First Baptist Church of Newton on May 7, 1911.